Precious metal thin film materials manufactured with our sintering technology are highly regarded in the electronics industry, particularly in the semiconductor and magnetic disk industries. As a leading company of sputtering materials, our company will continue to meet or exceed our customer's expectations in the field of increasingly sophisticated thin film electronics. Our company manufactures extremely high-grade sputtering targets containing oxides for high-quality recording media by utilizing a unique manufacturing method that enables oxides to be finely and uniformly distributed throughout the magnetic materials. Targets with finely and uniformly distributed oxides have fewer particles which enables stable sputtering. The alloy composition and added oxides have become more complicated than before because of increased hard disk capacity. With our technology, it is possible to manufacture targets that fit such technical trends. In addition, it is possible to offer a wide range of targets according to customer applications, from prototypes to mass-produced products. We provide comprehensive support for sputtering processes, including recovery and recycling of scrap and recovery of precious metals on parts. * The alloy compositions in this table are typical examples. For other alloy compositions and added oxides, please contact us for further details. Precious metal thin film materials manufactured with our outstanding melting, sintering, and recycling technologies are widely used in the field of semiconductors. 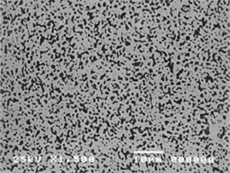 This is especially true in the field of MRAM (Magnetic Random Access Memory), which is attracting attention as a next-generation high-speed, high-capacity memory, and we manufacture high-quality iron-platinum alloy targets by applying our production technology developed for targets for magnetic recording media. Our targets manufactured by degassing with vacuum melting and using rapidly-solidified fine powder have highly homogeneous composition distribution, providing higher performance with reduced particles. Vacuum melting technology has enabled the reduction of residual oxygen. High purity (99.99% or more), high density, and extremely uniform composition distribution. We are ready to meet a variety of requests, such as the addition of ternary or quaternary alloys, and various oxides. *For other alloy compositions, please contact us for further details.